HOLIDAY HOMES TO RENT IN ILLE-ET-VILAINE, BRITTANY. Welcome to our selection of holiday homes to rent in Ille-et-Vilaine, France. The departement of Ille-et-Vilaine is located within the northern region of Brittany, a popular destination with British tourists because of its proximity to the ferry ports and its pleasant seaside resorts. Ille-et-Vilaine not only offers sandy beaches, but also historic towns and villages, beautiful natural scenery and some of the best seafood in the whole country, especially the famous Cancale oysters. The weather may not be as dependable as in areas further south, but the attractions in Brittany, and Ille-et-Vilaine in particular, more than make up for the cooler temperatures and increased rainfall! The Emerald Coast on the English Channel is home to the most popular of the region's seaside towns and villages. Stretching from Grouin point, a spectacular rocky headland with views over the ocean, to the town of Val Andre in the departement of Cotes d'Armor to the south, this stretch of coastline is home to some of the most spectacular beaches in France. Sandy beaches mix with rocky coves and cliffs to create scenery that is as perfect for walking as it is for sunbathing. The town of Dinard is one of the most visited of the resorts on the Emerald Coast, with many of its hotels and apartments still housed in the 19th century buildings constructed when the town first became popular with tourists. There are several beaches within walking distance of the picturesque town centre, and many of the marked footpaths and hiking trails of the Emerald Coast have their starting point in this northerly town. Saint Suliac, sheltered in a natural bay between Dinard and the Grouin point is a traditional Breton fishing village, with stone cottages and a natural harbour on the river. Although the town has no beaches, there are plenty within a short distance, and you can always take a dip in the River Rance if the weather is too hot. The main town of Rennes, right in the centre of Ille-et-Vilaine, is also the historic capital of the Breton region. The medieval town, with its cobbled streets, half-timbered houses and lively squares filled with pavement cafes, fountains and sculptures is busy throughout the year with visitors. Every Saturday morning, there is a large market held in the main square, while the town hosts an unusual festival involving clowns, acrobats and musicians performing in the streets every July. If the Brittany weather gets too much, you can always take shelter in the town's museum, which details the history and traditions of the region. South of Rennes, there is another museum that boys of all ages will love, dedicated to vintage and modern cars. Looking for self catering holiday accommodation in Ille-et-Vilaine? 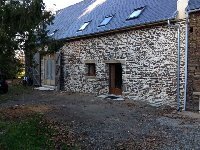 Then below is a selection of gites in Ille-et-Vilaine and villas in Ille-et-Vilaine that can be rented direct from their owners. You can either click on each listing for further details or you can use our search engine on the left if you are looking for something in particular.